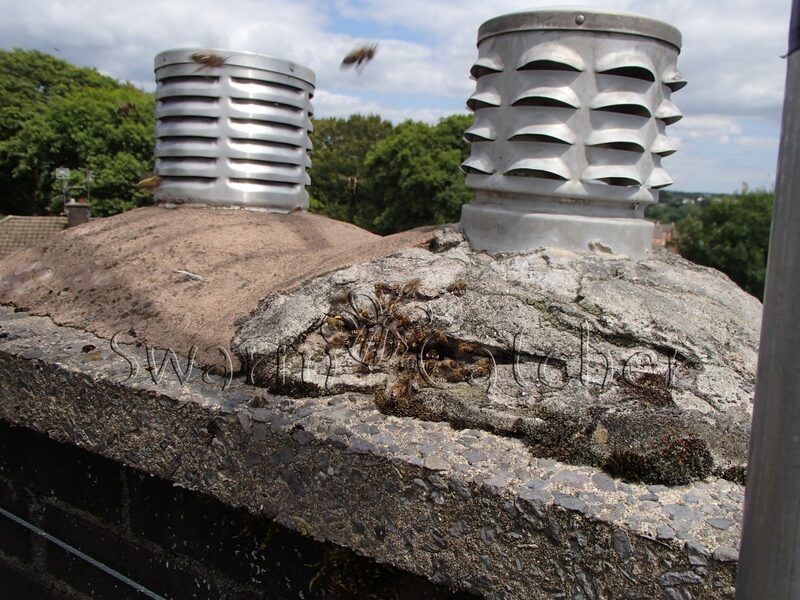 Often bees will find their way between a gas flue liner or solid fuel burner flue liner and the original chimney, more often than not it’s the space between the gas flue and the original chimney. 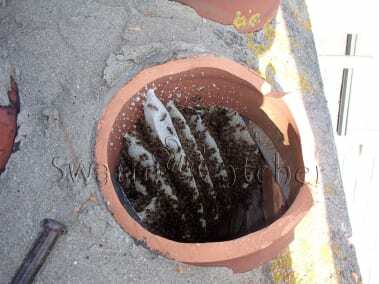 These liners tend to be flexible steel liners, rigid metal liners or concrete flue liners. 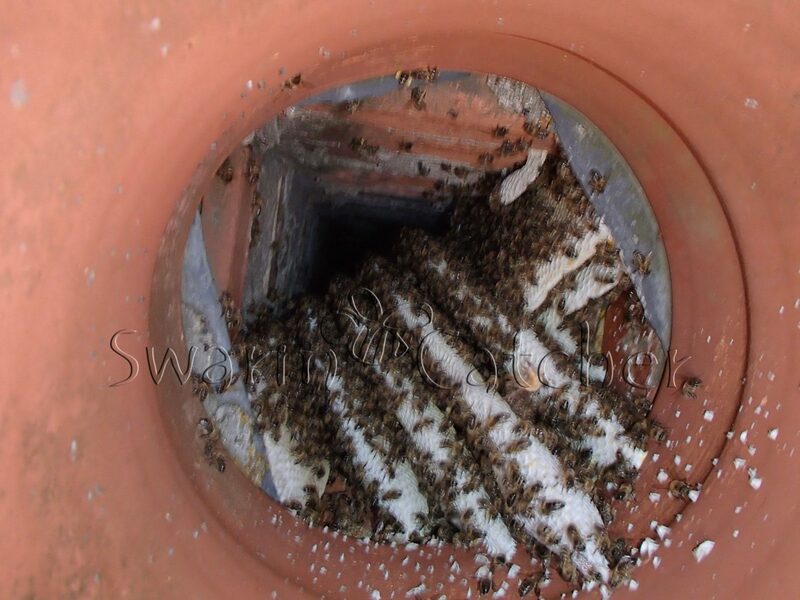 Often if the liner is a rigid metal or concrete flue liner the bees nest can be removed without having to do anything with the liner, unfortunately if the liner is a flexible flue liner it usually needs to be removed. 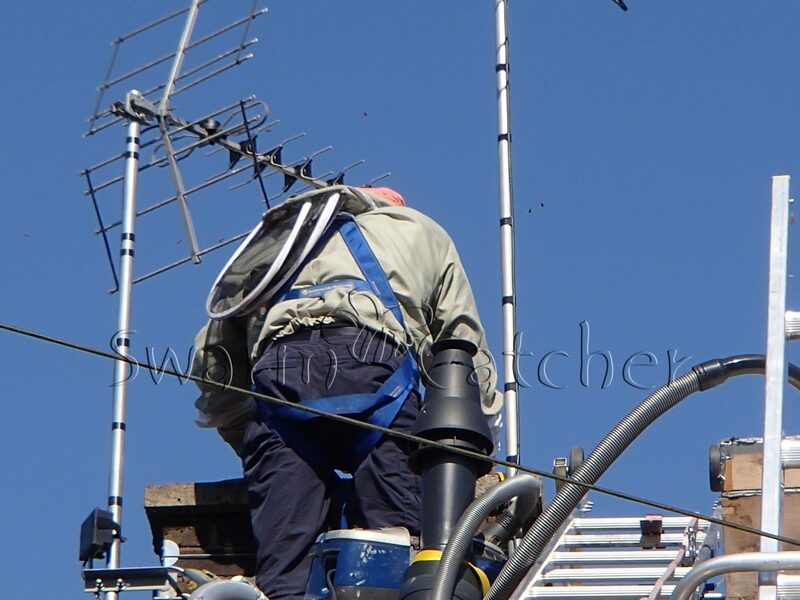 There’s lots of reasons for this and they are all for your health and safety. 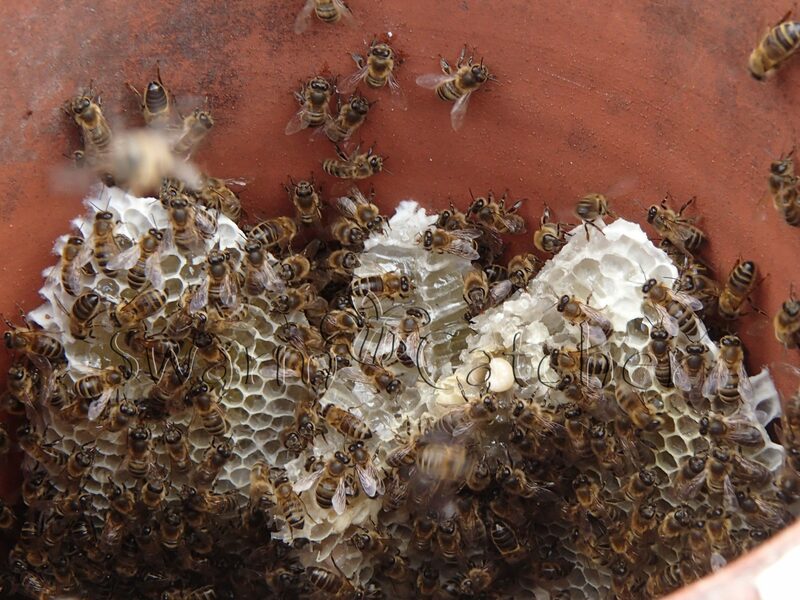 Obviously there are occasions when this is not the case mostly to do with the length of time the bees have been in situ. 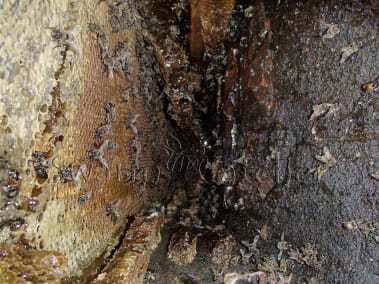 In all instances that a liner may need to be removed we suggest talking to your local gas engineer (or solid fuel HETAS engineer) about the likelihood of the fire needing to be decommissioned and removed so that we can carry out the task of removing the bees from the chimney, after which the gas engineer can reinstate and recommission the gas fire. 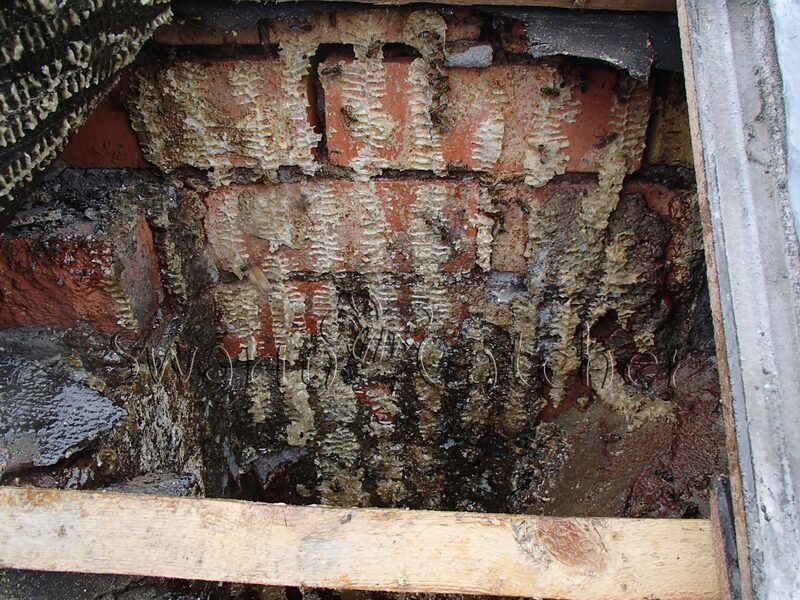 We recommend that you arrange for this to be done yourselves, but can advise you on the need for this if required. 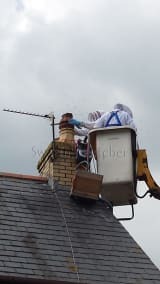 If there’s a flue liner for a wood or multi-fuel stove in the chimney then once we have removed the honey bees in chimney stack (ready for relocation) the flue liner and stove connection needs to be inspected by a HETAS engineer before the system can be used. Obviously there are occasions when this is not needed mostly to do with the length of time the bees have been in situ, but you should be aware of the possibility of it. Honey bees will also colonise an unused open chimney space that has either been capped to allow the chimney to breathe (these are rarely designed to keep wasps and bees from setting up home) or left uncapped, allowing rain and anything else access. It is not that common for honey bees to occupy a chimney that does not have some sort of cover unless there is a substantial lip beneath the pot. 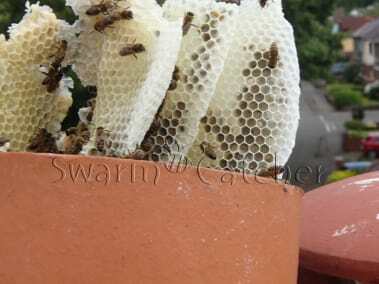 This is because they need to be able to attach and hang comb from something. 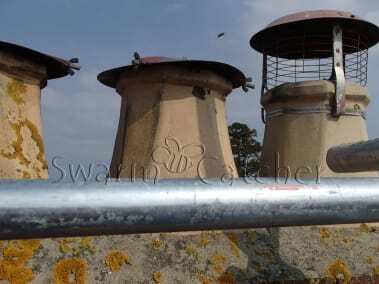 when we do come acroiss this situation there is often some wire mesh on the top of the pot – intention of which is probably to prevent birds nesting particularly jackdaws. 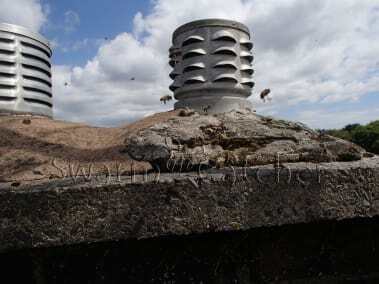 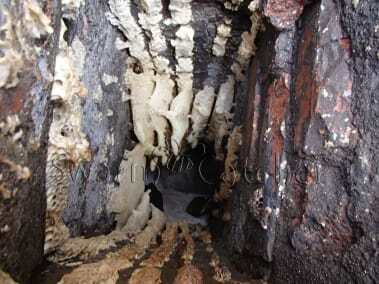 We also go to a lot of chimneys that have been sealed over with a flag stone or completely flaunched. The honey bees are usually gaining access to the chimney space because of the effects of weathering on the flaunching or poor quality mortar mix. 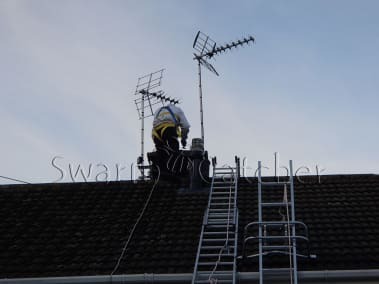 In these cases we always recommend that you discuss how you reinstate the chimney with your chimney sweep as most disused chimneys should be allowed to breath as well as be capped to prevent water ingress or further infestations of honey bees or wasps. 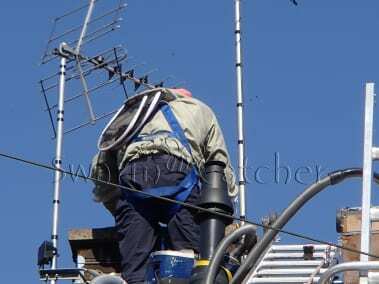 For a lot more detailed info about “honeybees in chimney” please see our page removing-bees-chimney where we discuss the subject more deeply. 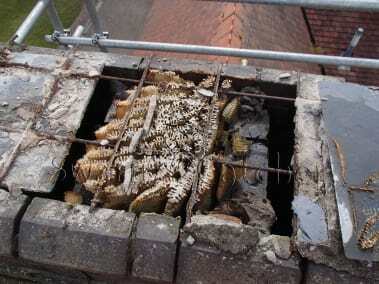 When removing “honey bees in chimney” we aim to remove all the bees alive, the comb, the honey and the bees wax. We have not yet needed to dismantle a chimney to do this – not saying we haven’t felt like using a stick of dynamite on the odd occasion, or that it maybe necessary to do sometime in the future, but for now we have not had to dismantle a chimney. The most common reason for honey bees being able to colonise these locations is down to the poor condition of the flaunching as a result of weathering and very often poor workmanship. When working on a honey bees in chimney removal we need to remove the flaunching and pot to allow proper access to the chimney flue to remove the bees. We are able to reinstate this at the end of the job providing we have time, but ideally it is better that you have the chimney properly inspected and repaired by a chimney sweep, usually if part of the flaunching is in disrepair then the rest of the flaunching also needs removing and reinstating. 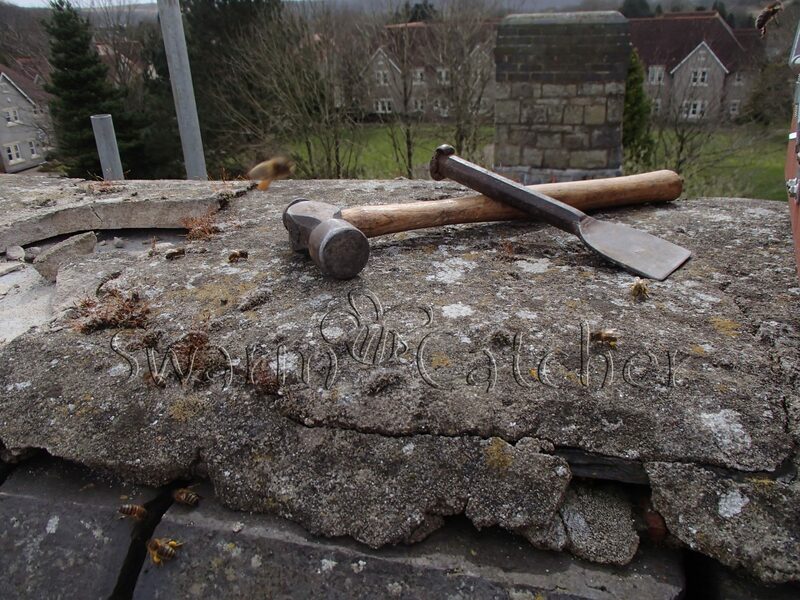 Very often the pots should be changed at the same time, despite them appearing to be in good condition on removal and reinstatement, they can often crack over the next 12 months or so. 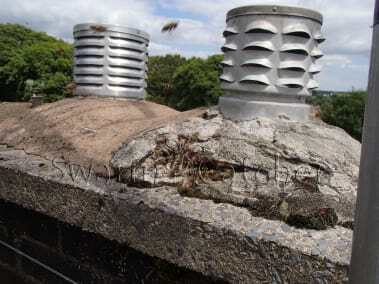 A good test for this is to give it a tap and listen to it, it should have a clear crisp bell sound. 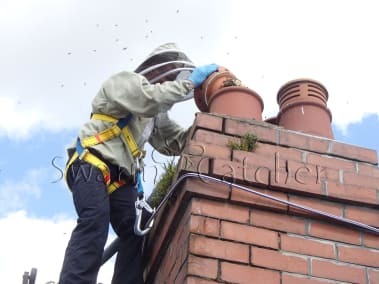 If you are looking for more info on removing bees from a chimney check out our article ‘Removing bees in a chimney‘, or you repeatedly have bee swarms take up home in your chimney you may want to look at our page ‘Why honey bees like chimneys‘. For information on bee removal and relocation from roofs you may want to look at our page ‘Honey bees in roof‘, or if you have bees in a wall our page ‘Honey bees in wall‘ maybe of use.